READER BEWARE! The following post may induce a sudden separation from reality. The knowledge you are about to obtain may bring on a sudden loss of judgment in time and project management. If you are on the cusp of being an insane crochet queen, this might just be the straw that breaks the camel’s back! While I am all for purchasing a pattern that blows me away, modern technology has opened the doors wide to the availability of FREE PATTERNS! A simple Google search for FREE CROCHET PATTERNS will get you endless results; some worth following, some not so much. I’ve gathered a list of some of the sites I have found to be priceless, literally! AllFreeCrochet is a multi-purpose resource. Along with free patterns you have access to tutorials, a blog and giveaways. There’s more too. Some of the patterns are available on the site and are printable, while others link to websites. Though it isn’t required to access the free patterns, I highly recommend signing up. It will give you the availability to save the patterns you love and receive patterns in your inbox. Free and paid patterns but you can tailor your search for just free patterns. Ravelry is a multi-purpose resource. This site requires you to sign in before you can view. Totally worth it. They provide resources to save the patterns you like, post your own patterns, post and save projects you are working on. You can create a library and rearrange the items. Many of the patterns are available in PDF form, while others link to websites. Definitely worth checking out. Product Linked Free Pattern Sites. Red Heart – No sign up required. Downloadable PDF Patterns as well as online directions. My Mountain – Schachenmayr Yarn. No sign up required. Downloadable PDF Patterns as well as online directions. Lion Brand – Requires you to sign up to access the free patterns. Downloadable PDF Patterns as well as online directions. Yarnspirations – No sign up required. Downloadable PDFs and patterns are available. 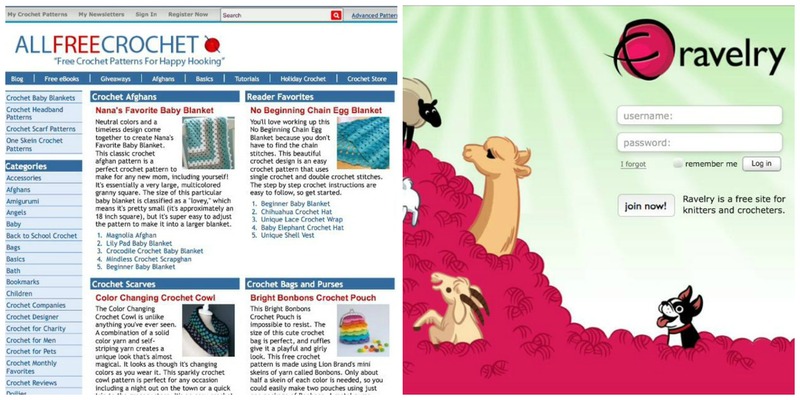 The Crochet Crowd – Have you checked out the free patterns on this site? Hello. Many of them have video tutorials. Who could resist a sit down crochet session with Mikey! Moogly – If you like themes and love free patterns, Tamara Kelly consistently posts theme related free pattern collections. She also has a vast free pattern collection on her blog. Petals to Picots – Kara Gunza offers 100+ Free Patterns on her blog. She also offers free themed pattern round ups. These are merely the tip of the iceberg, your free pattern resources are virtually endless! Chime In! I’d love to hear from you! What’s your favorite pattern site? Do you have a go to site that I didn’t list here? Tell me in the comments below. This entry was posted in Guest Bloggers, Hooked on Ewe: Sheri Goad and tagged all free crochet, Crochet, Free Patterns, knot just yarn, Lion Brand, Moogly, My Mountain, petals to picots, Ravelry, Red Heart, Sheri Goad, The Crochet Crowd. Bookmark the permalink. 53 Responses to Free Patterns: How Do You Crochet Without Them? I appreciate the list of “free” pattern sites to read, BUT, I only go to yours. Why? ’cause I know your site is secure. Some free pattern sites, just loads me up w/unwanted ads…. There’s a website I love visiting called Bev’s Country Cottage at http://www.bevscountrycottage.com/index.html. She has all sorts of projects, patterns and ideas! If I’m just looking for a new stitch to try for a kitty blankie I always check out about.com…..lots of favourite stitches have been discovered there!!!! I need some help. My daughter is expecting a baby boy in August. She picked out variegated yarn for me to crochet her a baby afghan. I’ve looked at many patterns. Do you have any suggestions? An awesome list Mikey!! I always refer to the above mentioned sites first (including The Crochet Crowd), but there are a few others that are great to look through from time to time!! These are all really great sites! I spent a long time getting the cupcake dolls and lollipop doll patterns on eBay a few years ago. A move lost them, I’m really hoping someone knows where to get them again. I have a trunk full of the colored yarn hair heads……. Everyone of you is right on, I think I have tried most of the ones you’ve all mentioned! There were a couple I hadn’t heard of before that I will check out now, but I also like to look through the vintage library, so gorgeous stuff in there!! My go to for videos is always Mikey and The Crochet Crowd first!! I talk about you guys to my friends all the time!! My favorite blogger for crochet patterns is RepeatCrafterMe. Sara makes the cutest things and most of her patterns are free! I am on pattern overload from the sites you listed. Self control for patterns is non-existant. I spend more time looking for patterns to match the yarns I have. I don’t mind paying for patterns when I know they are unique and are fun to do. Happy hooking! Love, love, love Ravelry as I am also a knitter. Crochet Pattern Central.com is my second go to place. When I see a pattern I would like to make, I look hi and low for a free pattern of it. If I can’t find a free one, I take a picture of it and try to figure out the pattern. Most times I make the main pattern and put my own touches on it. Mickey – I think that “PP” (pattern printing) is a disease, and no thanks to you – you who encourage me to “try something new” “here Beth, I’ll show you how” “Beth, you can do it” “All you need is a couple more colors – forget about the yarn (20 large plastic totes) in the storage closet…you’ll love these new colors” Yes, that is you Mickey!!! And, there you are…so cute…Mickey smiling and “showing me the way down the path to another “WIP”… and for heavens sake, Mickey, I didn’t know my fingers would do that to get that hook in to that stitch!!! I think my problem is: “I’M JUST A GIRL WHO CAN’T SAY NO” Mary Martin In BALI HI!!! So, remember Mickey, when you are making another video…I’ll be there watching your magic fingers reel me in again!!! But, thanks Mickey – you really are keeping this old lady sane!!!! Oh yes, Mikey IS bang on! I have bought a few patterns, but only if I haven’t been able to find anything similar for free and I fall in love with the specific pattern. I do subscribe to all the ones you mentioned and have made many pieces from each. I copy the patterns I want to try into Evernote which has a great advanced search function so I don’t have to tag notes or organize them further. I have used most of these listed but my favorites are The Crochet Crowd and Moogly. I do find myself usually looking at The Crochet Crowd first ( the site and Youtube) because I just love Mikey because he is just so awesome!!! I receive the AllFree Crochet newsletter every day, and have a separate folder that I keep them in, in my mail. I also have a folder for The Crochet Crowd newsletters. I usually just use those two sites for patterns, but have a few from Pinterest, too. When I print the patterns, I then put them in plastic sheet protectors and keep them filed in a binder, with index tabs. So, if I’m looking for a tea cozy, or an afghan, I just go to that section to see what I already have. Another great crocheting and crafting blog with free patterns is, RepeatCrafterMe. I love the Drops crochet patterns! I’ve made a ton of stuff from there. Also, Crochet Pattern Central. I love Drops Design patterns and they also sell yarn and have a Holiday Calender for all the different holidays with special designs daily. I love all of these, and have found most of them just by typing in free crochet patterns. I also love “Purple Kitty” free patterns. I signed up for the newsletter and get all kinds of “Old” Patterns….ones that were made 50 – 60 years ago……I especially like the baby clothes ones and also the Old afghan patterns. They also have lists of discontinued yarns and interesting tidbits…..And handbags and hats………It is well worth a thorough go look see……. Thanks! I will have to check it out! Sounds great. Mikey is always bang on. I always Google “free crochet patterns”, and I love to mix stitches from two or three patterns to make it mine. I copy & paste a couple of rows from each, which makes up the pattern for me, and they turn out beautifully. I bet you come up with some really fun project! For Free Dog & Pet related patterns check out http://poshpoochdesignsdogclothes.blogspot.com/ The list of free pattern is at bottom right of the blog. Many human related patterns, too. My favorite site is Red Heart because it is very easy to navigate and they add new ones frequently! Plus, Red Heart yarn is my favorite yarn and I know just what to buy for the pattern. I am so glad I found The Crochet Crowd also! The patterns are great and the challenges are a nice break from what I am currently working on and loads of fun!! I love the variety here! 🙂 from everyone posting to Mikey’s words of wisdom, makes for a well rounded place to hang out! Mikey is the coolest guy ever!!!!!!!!!!!!!!!!!!!!!!!!!!! For all things child related , Repeat Crafter Me . I’ve also used some free patterns from Craftsy. Thank you for sharing these other websites as I didn’t know about some of them. I also really like the b.hooked site. There are some really cool summer patterns out there! I use most of those sites too and I’ll add in Pinterest Boards are a great source for inspiration. Another site I like that has a mix of free and paid is Craftsy.com. Pinterest and Craftsy are great resources! I love the themed collections of free patterns!